Recently I saw a call for a day-in-the-life post, but I did one of those 2 years ago. Then a friend of mine wrote a week-in-the-life post. Hers was pretty cool, because her days are all different. I thought I should give it a try. I kept notes for a whole week . . and came to the conclusion that our homeschool is pretty boring. OK, this was one of the more ‘ordinary’ weeks . . no special projects, no doctors appointments. But still . . . ugg. Honestly, I wish you luck getting through it . . but here goes. The day started like most Mondays. At 10:00 I told the boys it was time to start school and Raven started screaming and whining and moaning, saying he hated school. After letting him sputter for a minute or two, I told him I’d make his breakfast while he got dressed, and soon enough we were all sitting on the sofa. I read the preface and first chapter of a book about the Battle of Antietam. Several times, Raven jumped up to pet an animal and I had to call him back to the sofa. I asked Raven who Jefferson Davis was and he had no idea, despite the poster behind his head. At least Orion correctly identified the president of the confederacy. The boys wrestled for a few minutes and then I got Orion started on his English paper. I told him to write the intro paragraph and he wrote a sentence. I gave him some more ideas and he wrote a paragraph. By now Raven was complaining of a headache. I gave him a snack and some ibuprofen. They walked the dog. Orion ate a first lunch. Growing teen, hobbit, whatever, he eats several times a day. It was time to go to home school martial art. When we arrived, Raven was crying, saying he felt too sick to participate. But the instructor, my personal hero, got Raven to participate the whole hour. I was trying to do some chemistry lesson planning, but occasionally noticed Orion pushing Raven off of him or trying to correct his behavior . ..which he’s not very good at. Poor teacher – she had 10 kids at 6 different levels, all on her own, and I think 4 of them are what I would call easy kids. After all, this IS the homeschool class. We get home and ate leftovers. I ran out to grab gluten free pretzels at the supermarket and a book we had reserved at the library. Raven and I did a Logic of English lesson without him crying. That is noteworthy. Now he is reading his science. Orion did two of the three math problems I assigned. The second one I helped some and it’s still wrong. I tell him to do chores and review his English paper and be done. Raven still has to do his math, but its computer based and he usually only does about 10 minutes a day. I’m fried. The day is cold and cloudy. It 4 and I get a 90 minute break before I make dinner. I swore I would start on time Tuesday, but I have hard time without the Martial Arts class deadline. I slept in and updated some curriculum plans and let the boys have a lot of time on their beloved electronics and we finally started at 11. We cleaned the table, got Raven breakfast and Orion an orange, and I read 2 chapters from the book about Antietem. Raven said several times that if he was a rebel soldier standing behind the Union general, he’d shoot him . . .and then just a few minutes later was asking “Who is McLellan?” He did seem interested in understanding the ways McLellan was a good and a bad general, but I’m not convinced he’ll remember much. It was a warmer day and the boys played with the dog in the front yard before walking him. Then lunch, then some chemistry on khan academy for Orion, to reinforce what we did yesterday, and Raven decided to explore as much free content as he could find on Brainpop. Orion couldn’t focus so he took a jog around the block. Next he made chocolate flourless cookies, which I put on his checklist last week, somewhat jokingly. Raven is STILL on brain pop. I’ve been trying to get us registered for the World Education Games with no luck. Its 2. Its 3. the cookies are yummy! I read a few pages about Australia to Raven and had to sit next to him without commenting as he did the associated puzzles. Orion is trying to get out of working any more on his paper because he wrote 2 sentences already. Nope. Did I mention how yummy the cookies are? Orion finished a rough draft and hid in the bathroom for a while. Raven and I finished up three logic puzzles and started on spelling, as Orion came in and started on math. Raven is highly motivated by humor. “Clock. I want to clock you in the head with the clock” got a lot of laughter out of both boys. I did have to remind Orion that a2 – b2 = (a + b) (a – b). And that must have distracted me. I started to ask Raven how many syllables in ship, just as Raven announced he was petting Charlie . . and I ended up asking how many Charlies are in ship. The boys stared at me as it sunk in, and we all laughed until we were in physical pain! Finally we finished spelling and Raven moved on to his math as Orion finished up his. 4:30 . . . Orion has been done for about 10 minutes. Raven just finished his math and argued over the laundry/dishwasher chores. I finally told him to just do the dishwasher. He’ll do laundry later. I finally got the registration working, with help from one of my online homeschooling boards . . see, they AREN’T a waste of time! Need to start working on dinner in 30 minutes . ..
Wednesday is our light day. Yes, I know, you thought the first two sounded light. We started fairly promptly at 10:05, cleaned the table, fed Raven, read a chapter of history. Then I got the boys to log in to World Education Games to set up their avatar and play some practice rounds – they loved it! Then walk the dog, a 20 minute break until martial arts. So, Mondays’ martial arts class went relatively smoothly. Not this one. As soon as we arrived, Raven announced that he felt sick. I pushed him to go in and change. Orion came out promptly, in his dobak, and announced that his legs ached. I pushed him to go for at least the warm-up exercises. Raven had not gotten dressed yet, and eventually he came out, still saying he was sick. I told him to TRY . . . but about that time, Orion said he needed to sit down. Soon he said he was having a panic attack due to the noise, and went to a quieter space. Raven did make it through the whole class (minus the first 10 minutes) but his behavior was terrible . . . wriggling around, playing with younger kids instead of paying attention, etc. Orion never came back in. By the end of it, both boys and mom ALL had headaches. Fish sticks and apples and leftover cookies for lunch. No more complaints of headaches . .. so off to the park – its sunny and 50 in January! Park day went well – everyone found someone to play or talk with, including me. We passed a school on the way home and Raven talked about how it would be nice to ride the bus home with your friends after school. Hmm. 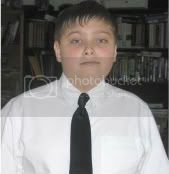 I really want him in public school for high school, but I’m not as sure about middle school . . . we’ll see. I SWORE I would be quick this morning, and grade all of Orion’s papers, and start us by 10:30. It’s now 11:15 and I’m just making the assignment checklists. We read a chapter of Antietam, which I’m enjoying even if they aren’t The boys walked the dog and we all had lunch. Orion has moved on to doing work – studied his driver’s license material for about 3 minutes (!) and now is watching the religions videos I assigned. I’ve got a load of laundry in and plan on making the pie crust for dinner shortly. Its 1:30. Orion finished his videos and is eating fruit. Raven is back on Brain Pop. I am making crust, second load in the wash, and promising Raven we’ll start geography and English soon. Orion said he was tired, so I sent him up to his room to lay in bed while reading his chapter of LOTR. Raven and I got through the Australia adventure pretty easily, but he balked at the idea of writing plurals in his language arts. 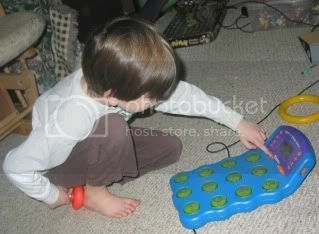 He laid around moaning for a while, and got back on brain pop. I called Orion downstairs from his room. He finished up the LOTR worksheets, but started to lose it over chemistry. I helped him work through the first problem, and he was able to work through the second problem with an example from the book. I did more prep for the pot pie, and got Raven back to the table where he’s still crying over his LOE lesson. Orion tried to get out of math and I told him to finish 2 complex word problems as it’s already past 4. We still need to clean the house for the junior Lego team, and Raven has yet to do math or science. Orion spent 10 or 15 minutes on his first problem and got it wrong. I looked over his work and could not find the error. I told him to just do his chores and stop. Raven finally did his English without too much drama, read 10 minutes of science instead of 15 (because its late and he probably did some science on brainpop) and yes, you have to do math, because this is a 90 day subscription program and I want you to finish it before it runs out and we already took off 3 weeks over xmas . . don’t ask. Its 4:55. ugg. I just put the pot pie in the oven and the junior Lego team gets here at 6:30. Raven is just finishing up. I wanted to start promptly this morning because we are supposed to have a ‘play date’ with two girls around my boys ages, who love video games. Well, 10:25 is less than half an hour late, right?! I read another chapter of Antietam – the troops are now lined up for the big battle – but my boys can’t seem to take any more of this book, so we’ll move on next week. Since the dog was restless and the boys were fidgety, I told them to go ahead and walk the dog, but Raven got distracted by a cat while getting socks out of his room. We only have 3 hours until we need to go . .. and a lot to do. Harrumph. The dog was walked, the lunch was eaten. I graded several of Orion’s papers while they were walking and sent him feedback. Orion watched his religion videos, then went upstairs to lay down . . . uh .. with his hand held. Oops. Raven was willing to do geography right away when Orion went upstairs, and we finally finished Australia. He wanted to look a tiny bit at Peru . .. which he thought was Perry, and then par – roo . .. PUR like a cat . . .PUR ROO. We had a great time! They had moved from . .. Wyoming? Montana? I can’t remember . . about 3 mo ago. The older daughter is 3 years younger than my older son and the younger daughter is 1 year younger than my younger son, and they are all really in to video games and web culture – they had a blast ! the mom and I also really hit it off, talking about all sort of things under the sun. What a great end to the week! As a wrap-up for our study of the Declaration of Independence, I decided we should write our own declaration. I used this website for some questions to ask the boys. The three of us brainstormed the list of complaints together, and Orion and I did most of the ‘what are you going to do about it’ questions. Then I sent all our notes and a link to the original text to Orion . ..and he put together the first paragraph and the list and sent it back to me! I did cut the list slightly (to make it fit on a page!) and I wrote the last paragraph. We think it came out pretty well! Click on the image to see it full size. 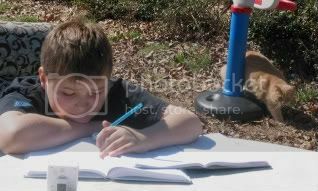 Fall of 2011, home school status report! This fall’s curriculum is going very well! The only adjustment I’ve had to make so far was for Raven’s writing curriculum. Our schedule is VERY busy. Here, let me explain. Joint History: We are reading about 2 chapters of Joy Hakim’s History of US, together, on the sofa. This is a 10 book series, and I hope to finish it in 2 years! This is supplemented with appropriate selections from Chester Comix, and occasionally other books or videos. We generally have the map of the US, a World History Atlas, or a blow-up globe with us (the dog is TERRIFIED of the globe). Oh, and I sometimes pull up Google earth on my iPad, too! History (additional): he is finishing up the Little History of the World. Next, he will probably do a unit study on the presidents. English: we are finishing up the writing and vocab components we didn’t finish from last year’s curriculum (level 3 – very rigorous). If/when we finish that, we will do some combination of the next level of grammar and vocab from the same publisher, a teen writing curriculum, or a game-based fiction writing curriculum. Math: we have just started book 2 of the Singapore New Syllabus. Orion has been doing very well with this. He looks up the answer after finishing a problem, and if he gets it wrong, he keeps working at it until he gets it right. I am very happy with this! Science: Orion is reading through the second half of the high school ap/intro college bio textbook we started 2 years ago, and doing the end-of-chapter problems. He will be taking a dissection class starting February. English: We are now using Language Smarts from the Critical Thinking Co. It’s a great fit because it is more like logic work based on language. The last thing we tried was Spectrum Writing workbook, which was a total failure. Before that we tried having him write to pen pals. Yeah, like pulling teeth. 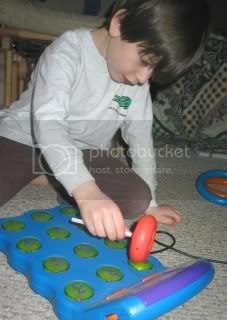 He is willing to do this one (so far, 2 weeks in), and I know he’s learning something. He is also reading for fun, finally! Mostly Garfield books, and some Stink books. Dad also continues to read to him at bedtime – this month its books in the Time Warp Trio series. Math: We were lucky enough to get chosen to review a chapter from an upcoming math series. Raven LOVED the textbook, which is comic book style. He resisted the exercises at first, but was able to see for himself that doing the easier problems first helps him to do the harder problem. This was a major breakthrough for him! Now that we’ve completed the chapter, we are back to what we were doing over the summer. We are reading Murderous Maths books, and doing problems from Zaccarro’s Primary Challenge Math. When we first started this combo, he would only do the level 1 and 2 problems in the Challenge Math book, but now he’s doing level 3 and ‘Einstein level’ problems, mostly in his head, with only the occasional hint from me. We may continue on to the next level of Challenge Math, or we might try out Problemoids – in fact, the owner of a math website is trying to get us a free copy of that to evaluate as well! Science: in the coop, we are using Real Science Odyssey Chemistry. Raven seems to think its ok, and I only have to teach every third week. He’s also reading a lot about the planets, which is still his biggest area of interest. This schedule is exhausting for me, but the boys really like getting out of the house so much. The academics may be slightly on the light side, but my philosophy is to meet them where they are. I don’t want so much work that they get panicky or scream and cry or learn to hate school. I try to come up something they are interested in with just enough challenge, and a format that works for us all. This week I saw two things which really spoke to me about homeschooling. I have not blogged much this second year of school. Some of it is due to various external issues making it harder to get around to writing. But some of it is about how things change after that first year. 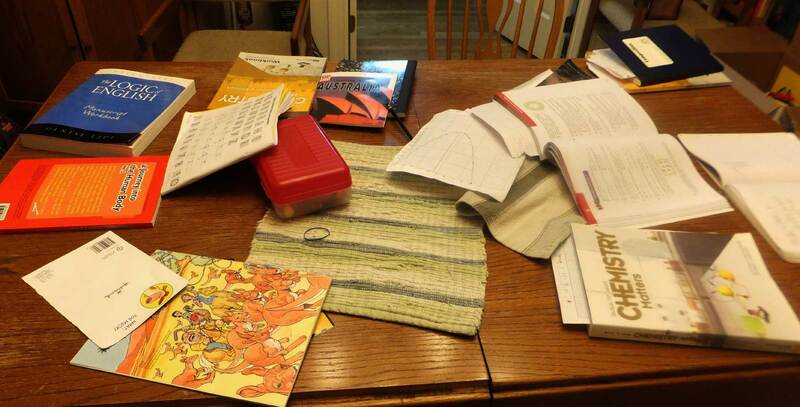 The first year of homeschooling, everything is new and exciting. You are trying to pick curriculum, trying to find a style, and then you are amazed each time your child actually learns something . . . you know, without being in school! But after a while, you just get into your zone. There are fewer questions to ask, and the learning moments become less surprising. So what did I see which was so inspirational? The next item was a blog entry from a woman I met when she stepped on to a sudden void and became the minister of my UU church for a year. I think that, to a great extent, this year I started to really hit my stride. I started to accept that it’s ok if I work better with a schedule than without. I started to feel like I knew what my teen needed to be focussing on. I started to trust my 7 yo to know what he wanted to learn next. I learned how and when to push each of us, and when it was time to just let things slide. I look at the kids. I accept myself and them as we are now. I do what makes sense to me. When it doesn’t work, I take a fresh look and do something different. Really, I highly recommend it! I decided to document a typical thursday in our homeschool. All times are VERY approximate. 9:15-ish dh and I come downstairs after showering. boys are in pjs playing on electronic media. dh leaves for work. 11:00 (ok, if I’m feeling really lazy or lots of my friends posted really interesting things overnight, it might be 11:30) I announce its time for school. Raven shakes off and sorts placemats from the dining room table, and puts them where they belong. Orion removes everything else from the table and I wipe it down. 11:10 Orion starts french and Raven and I go upstairs. Raven gets dressed and we sit in his bed reading together. Right now we are going through every book in his shelf to see if we can get rid of some. Doesnt look like we can! 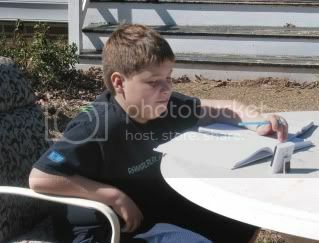 11:30 I come downstairs and Orion and I start on MCT LA – monday is poetry, tuesday is grammar practice, wed is vocab, thurs and fri are writing. Raven has free time to play w toys, pet cats, whatever. 12:00 Raven does Time4Learning (whatever he wants to do there) and Orion and I do math. 1:00 we eat lunch. The kids might watch an educational video during lunch. Orion might read. I might be on fb. if we aren’t running late, we might do some chores or take a (no video games) break, meaning Orion and I can check fb. around 2:00 we go back to the dining room table and read 4 pages (2 spreads) of the Usborne history book together. Next, Raven does a half page of handwriting. we are supposed to do something else after that, but havent managed yet. Orion reads a chapter of Story of Science, a chapter of Little History of the World, and a few pages of Asimov’s Chronology of the world. If he didn’t read fiction during some of his free time during the day, he also reads 30 minutes of fiction. and we’re done by 3 most days! Of course, monday and Wednesday we have martial arts at noon, so we skip french and dog walking. Wed afternoon is left free for park day and friday afternoons might be left open for a project of some sort. 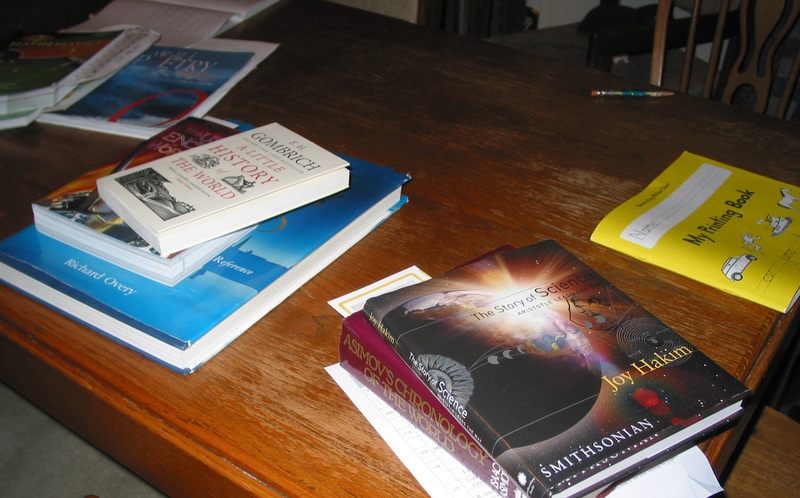 Note, when the dining room table looks like this by the end of the day, I feel like we must have accomplished something!! Yeah, that’s a little dramatic. How about the first week of my new schedule! Or of 2011! I made my usual new years resolution . . . floss my teeth more often! But there were other things I just couldn’t bring myself to say out loud. AFter rereading 2009’s year in review, and writing 2010’s year in review, i saw more clearly how much of the stress of the last two years was about my daughter. She moved out in september, and 4 months out, it’s looking like she is settling in stably to her new home. So i realized its time to stop living as if I’m in the middle of an ongoing crisis, and get back to business. Over the break, I put together a plan for the first few weeks of our science/history curriculum. Just before vacation ended, I created a weekly schedule, similar to the one I used when I first started homeschooling. Monday was the first day of the new schedule. And it went pretty well. We began with a song from a UU songbook, which both boys seemed happy to participate in. My first day of martial arts after a 2.5 week break didn’t kill me. Raven’s fear that history would be boring was unfounded, and Orion liked all his books and his afternoon reading assignments went faster than he had expected. Tuesday was going well until Orion and I decided it was time to see if a cup of tea would help with his adhd symptoms – several of my friends had had great results. Instead, he had a major flare-up of his tics. we had to tweak the schedule and watch a video on egypt instead of doing math. Wednesday is supposed to be park day, but my new plan is that if the weather is not good enough to go the park, we’ll do board games. We played a game of States Bingo and a partial game of Equate, which is like Scrabble with numbers. Very nice. Thursday had a late start (because the cat had turned off the alarm) and for some reason, Orion went in to crying/panic mode. Again we had to shift the schedule around a bit, but again, we got everything done (except math). And then there was friday . . . the day that I slept 2 hours later than my usual wake-up time and felt like a zombie. Finally, I felt there was something our schedule couldn’t quite fix . . . so i declared a sick day. Overall, having a schedule did make the week go more smoothly. Even on the days that something came up, for the most part I was able to tweak the schedule, instead of giving up. I felt like we got more done with less stress than we did before break. Hopefully we can keep this up . . and who knows, maybe I can get back to blogging, too. But no promises! Wishing i’d had a camera! TWICE yesterday, I really should have had my camera! Second time I really needed a camera: Orion’s 6 week drama class had their play today! This class had only 3 boys in it, which is quite unusual. Orion had the lead in a 2-person skit (the other boy was somewhat of his straight man), and also did a monologue. I had no idea my son was so adorable in a top hat! At least I snapped a picture at home, before I took him to class. Ok, you have to believe me – a top hat and a big grin made a HUGE difference . . . The other day, a news article was published discussing the fact that the largest publishers of home school textbooks do not support evolution in their science books. Of course, many home schoolers find this article to be a good excuse to get mad and argue about something. But that’s not what I took away from the article. Instead, it left me wanting to make sure that all secular home schoolers can find support and curriculum resources, and it especially left me wanting to find curriculum about evolution! Which turned out to be harder than I thought. It is really hard to find secular science curriculum, especially for the upper grades. Many curriculum which appear to be secular are still created by creationists! So what can we do, as home schoolers who believe in evolution? http://groups.yahoo.com/group/secular_homeschoolers/ is a national (or really international) group for secular home schoolers. It’s a great place to ask questions about curriculum and connect with people locally, as well. Berkeley has a great evolution site – THIS links to the lessons index, but at the top of the page you can navigate around the site. http://www.charliesplayhouse.com/childrens-books.php At first, Charlie’s Playhouse, which advertises itself as a website of evolution toys, seemed mostly like a time line and some t-shirts. I finally discovered their book list! They have nearly 100 book, targeted to ages fifteen or under and squarely focused on evolution or Darwin, and have a dozen starred as their top picks. What else can we do to help home schoolers find great curriculum, especially about science and evolution? Join my new Facebook group, I home school and I believe in evolution, and lets brainstorm! And please leave any additional suggestions below, or on the face book page. Note, I am not interested in controversy. Any posts which I feel are controversial or insulting to anyone will be deleted. Anyone making which I feel are derogatory towards me, my posts, my blog, or my group will be banned from making further posts. EDITED 3/14/2010: I have changed the name of the facebook group to “I home school and I teach the science of Evolution.” Its still not perfect, but many people were uncomfortable with equating evolution with a belief system. I think I like Mondays. We’re all fresh and rested from the weekend, and ready to get started. And it looks like this morning was all about enjoying math! 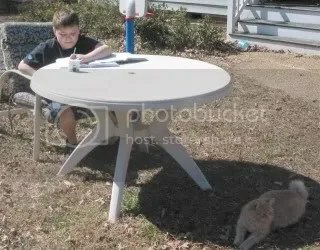 Orion decided that since it was such a beautiful day, he would drag a table and chair out in to the sunshine, and work on his Life of Fred pre-algebra. Wait, who is that, sneaking around? Its Fluffernutter! See, Orion doesn’t go to school by himself! Of course, we’d lost the mallet, but we improvised. 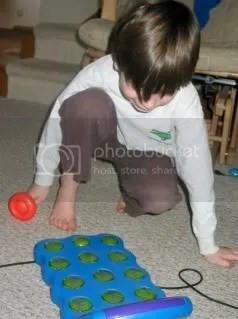 This toy is a bit frustrating, because you have to wait for the right number to light up before you hit it, and then AFTER you get the right number, you have to hit ‘enter’ (to allow 2-digit answers). It also goes from level one, using numbers from 1-15, to level 2, using numbers from 10 – 99, if you get 10 in a row right . . . but level 2 was MUCH too hard, because it’s timed. Ok, this last one is not a great picture, but can you see that grin! It WAS fun to get the answers right and be told Good Job! And no, we hadn’t cleaned that room in a while . . .thanks for noticing . . .
My first curriculum review was of Discovery Streaming, which I love. However, it has its limits. The discovery streaming videos often go further towards making a subject fun, rather than making it clearer when you are stuck. Not all of the videos will play on my son’s i-pod touch. Plus, as we progress through our AP level biology text, I find that the Discovery Streaming academics are not quite as rigorous and detailed as we need. But luckily, I found another option. It’s FREE, it always plays on my son’s hand-held, it covers math from addition through calculus and beyond, it covers biology, chemistry and physics at the basic college level, and there’s even information about economics and the banking crisis. This option is the Khan Academy. Khan Academy is a HUGE collection of educational lecture videos created by Sal Khan. He began this project as a way to tutor his younger cousins remotely, in their grade school math class. The videos don’t show him, they show a virtual black board where he writes in multiple bright colors. He speaks calmly and clearly over the videos, explaining things in a logical order. The many thank you notes shown around the side of the video library page are amazing, and Mr Khan says that’s really what makes it all worth while for him – knowing that he’s helping people. And again, I am not getting any sort of payment or anything for my reviews, I just want to share what I’ve found.